We're happy to offer our DC readers the chance to attend a free advance screening of The Nut Job 2: Nutty by Nature. SYNOPSIS: Surly Squirrel (Will Arnett) and the gang are back. We are once again in Oakton where the evil mayor has decided to bulldoze Liberty Park and build a dangerous amusement park in its place. Surly and his ragtag group of animal friends band together to save their home, defeat the mayor, and take back the park. NUT JOB 2 also features the voice talent of Katherine Heigl (The Nut Job), Jackie Chan (Kung Fu Panda 3), Peter Stormare (Penguins of Madagascar), Bobby Cannavale (Ant-Man), Isabela Moner (Middle School: The Worst Years of My Life), and Maya Rudolph (The Angry Birds Movie). The screening takes place on Saturday, August 5th at 12:00pm (note the start time!!) at Regal Majestic in Silver Spring. If you'd like to attend, simply register at the Gofobo ticketing site here and download an Admit-Two pass. Please remember that having passes does not guarantee entry as all screenings are first come first served. You will need to arrive at the theater early to ensure receiving a seat. Enjoy the show! 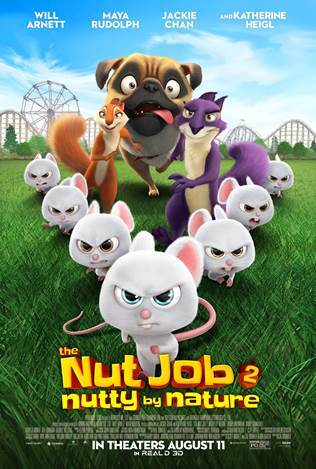 The Nut Job 2: Nutty by Nature opens August 11th.